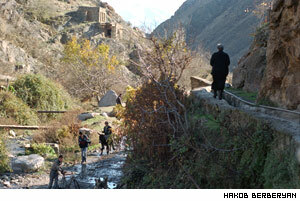 The last Armenian village before reaching Iran, Nyuvadi is buried in the rich foliage of the Araks river valley. 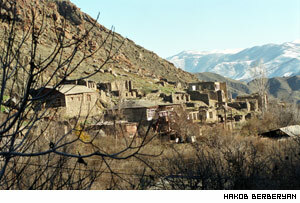 It is home to 45 families, and the southernmost settlement of 13 villages in the sub region of Meghri (Syunic Region). Nyuvadi is connected to the center, Meghri, by a 30-kilometer road that is little more than carved rock. The distance between Yerevan and Nyuvadi is about 450 kilometers, about the same as to Baku, Azerbaijan. But while it takes 7 hours to reach the capital of Armenia, the capital of Baku can be reached in four and a half hours (via the Iranian side). “The road from Iran to the Azerbaijan capital runs through slightly bent lowland,” the truck driver explains. On the Iranian bank of the Araks, the renovated highway can be seen with considerable traffic, especially for the region. But Nyuvadi does not enjoy such a connection with its capital. “High passes, which reach up to 2,500 meters above sea level, make transportation rather difficult and the average driving speed is 60 km per hour or 1 km per minute,” says Harutyunyan. And the crossing through Tashtun pass is not only spectacular, but challenging. The road drops (or rises) two kilometers over a 20 kilometer stretch. Despite all the complex communication between Yerevan and Meghri, it wouldn’t be a great exaggeration to say that the 30 km section that connects the regional center with Nyuvadi is less laborious. The village enjoys subtropical nature, where there are almost no winters and in December and January persimmon, kiwi and pomegranate start blossoming. It is not just the road, but nature itself that isolates Nyuvadi. Vladimir Bayanduryan, 78, is one of the 153 residents of the village. Like most of the residents of Nyuvadi he is a refugee from Azerbaijan. “By some mystic coincidence the year when I was born, 1926, became an omen of my wondering destiny,” Vladimir says. “It was in that very year that the government of Bolshevik Azerbaijan made an administrative territorial reform in the republic, as a result of which parts of North Karabakh populated by Armenians in no time flat became parts of Shamkhor and Khanlar regions. Bayanduryan, twice a refugee, has been living in Nyuvadi since 1991, but is still not used to his surroundings. It is easier to pass along the canal than on the "road". However, the most irritating thing for the villagers is the attention of the officials to their problems. Or, it is more correct to say, the absence of any attention. During Soviet times around 180 hectares of land were under cultivation. Today only 52 hectares are cultivated. Crops in Nyuvadi must rely on irrigation from the Araks, but villagers say the unused cropland is not due to water supply. Simply, there is no need to produce more than villages can consume, since transporting goods to Yerevan is too expensive. Nevertheless, today Nyuvadi – an Azeri name – is being renamed into New Agulis. That’s the wish of the residents themselves. Villagers say they feel a connection to their national history. And, in fact, a connection to the history of civilization. Some say that 6,000 years ago in this very territory, the copper age was born. Sometimes, it seems not much has changed since.